Are you having a cuteness overload yet? If ever a one year old slayed a photo shoot, it was Quincy. She was too freaking cute. Quincy brought a little glamour, chubby cheeks and two front teeth to her first ever family photo shoot. 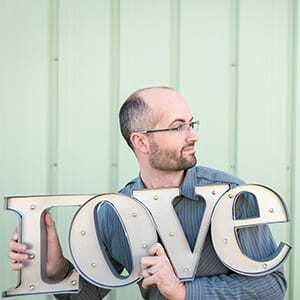 As a Cheyenne portrait studio, our city yields a vast terrain for us to use a backdrops for family settings. This location happens to be a private ranch, exactly as you would imagine Wyoming. Rustic barn surrounded by horses, cattle and tiny farm houses. Postcard perfect. When we arrived to the cake smash birthday party for Quincy, we had never met our wonderful clients but as soon as we pulled up to the ranch, Sarah came out to greet us followed by a gang of fur babies. So full of life and excitement for her babies first birthday, I knew she was awesome. Then we met the whole family, parents, friends and all, equally friendly. The best was saved for last, we when we met Quincy, who had just woken from her nap, looking so glamorous and ready for her photo shoot. The birthday girl, was all dolled up in a blue frilly dress with the cutest little baby shoes you have ever seen and a pearl necklace to top off her look. Mom and dad’s outfits also didn’t disappoint, as they were picture perfect and we couldn’t wait to get shooting. Here are some tips for getting ready for your session. We brought out all the stops for this Cheyenne family portrait session, complete with a lace teepee, tons of sequins, floral arrangements, faux furs and accessories galore. The art of children’s photography has become my newest passion, so pulling out all the high end props to document these precious moments is worth the car being totally covered in glitter most of the time. The location of their shoot was pure Wyoming, an old historic Cheyenne homestead out near Curt Gowdy State Park. The saying, “That’s Wyoming” couldn’t more accurate for this rustic gem. 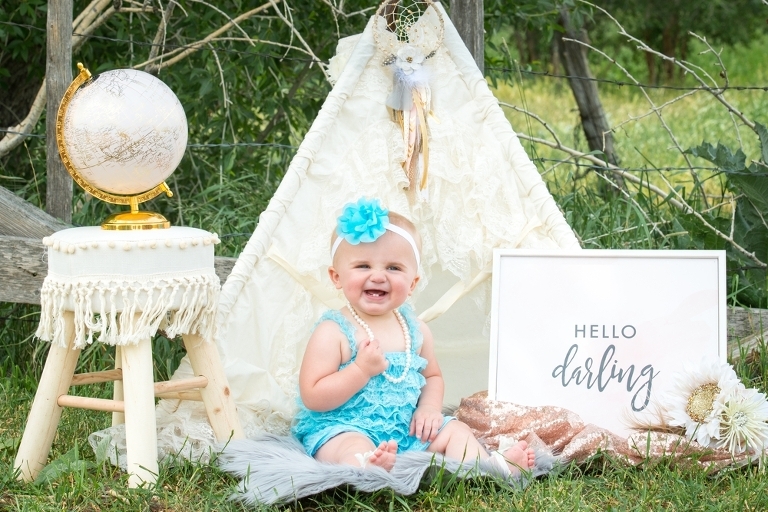 Settled in a valley at the base of Granite Lake we set up our boho teepee theme to capture how lovely Quincy looked on her 1st birthday. We mixed the shooting up a little with some of the whole family and then back to baby pics. Of course, we had to get a few snaps of just Sarah and Clint, it was easy to photograph them as it was clearly obvious how much they love each other. I think the photographs show that love effortlessly. Photographing the parents was the best part because while Jonathan snuck off with them for a few pics, I got to play with Quincy. Contact us today to book your family photo shoot. Invest in yourself and family with high-end portraiture to document special events in your lives. 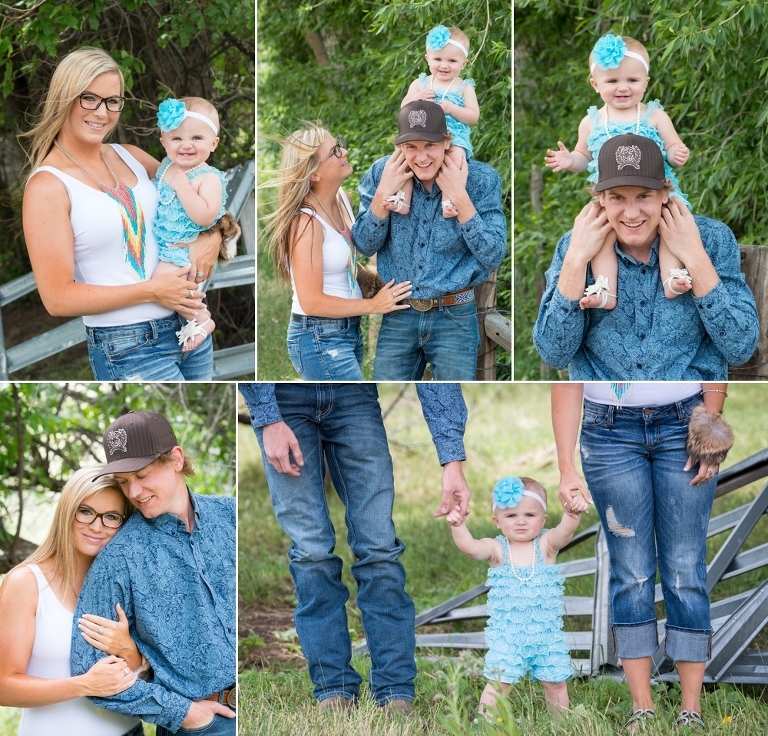 Make Riveted Photography your first choice for your Cheyenne family photographer.